Build a man-to-man defense that will hold strong through any situation! Jamie Dixon has led an immediate turnaround at Texas Christian University having won the NIT Championship in just his second year at the helm. This video of a live, 'Open Practice' session showcases the drills and concepts Coach Dixon has installed to construct a successful man-to-man defense. You will see why Dixon has become one of the top defensive coaches in today's game through the multitude of drills and skills he runs his team through in this session. 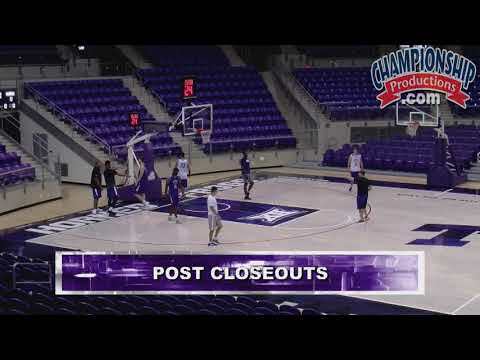 The TCU coaching staff provides specific teaching points throughout practice and in whiteboard segments where Dixon personally explains the important details to many of the strategies you will get a chance to observe in this practice. Great team defenses are composed of strong individual defenders that do not allow the breakdowns that lead to the offense gaining an advantage. See how Dixon raises the skill level of his defenders through four defensive fundamental drills that will develop closeout technique, improve instincts to jump toward the ball, challenge shots, help on dribble penetration, and play great denial defense in the post. These are drills any program can use daily in practice to build solid defenders. Coach Dixon demonstrates a variety of methods to get defenders connected into a united front. The George Karl drill intentionally creates confusion for your players to force them to quickly recognize the biggest threats and communicate every possession. See how to use a 3-Out 1-In alignment with your Shell drill to accustom your players to different angles on the floor while also involving post play in the defense. Two additional team drills force disadvantage situations to teach your players how to scramble and provide constant help defense. Your players will have to learn how to use great positioning, communication, and technique to succeed in these demanding drills. Learn how to instruct your players to fight through down screens set from different angles of the court as well as flare screens with Shell drills that will maximize the number of repetitions for your players to improve in practice. Dixon provides detailed teaching points on the technique required to utilize his technique for extending the down screen and chasing on flares. He also shows how additional defenders contribute to managing these screening situations beyond the two directly involved in the action. Adding in post defense makes this one of the most comprehensive Shell drills you will find. Help rotations are important for preventing layups when defenders are beat on dribble penetration. Dixon breaks down the responsibilities of players in help positions to provide this support and properly recover. Rounding out his defensive playbook, Dixon outlines his transition defense and press defense to make sure you're prepared for any situation. Learn how to protect the rim in transition and trap ball screens in the man-to-man defense. You'll see how you can convert into a 1-3-1 press out of free throw situations. This defense is a great way to create traps and force turnovers as your opponents struggle to get the ball safely across half court! You'll also see how TCU extends their pressure with the Diamond press. Thanks to his past battles in the Big East, Dixon's press is one of the toughest to beat for any opponent.